We are a Federal Credit Union Chartered on May 1, 1951 and since that time have been located on the premises of our original sponsor company, Airwork Corporation. Through the years, Airwork was purchased by several different companies until it was acquired by Dallas Airmotive. 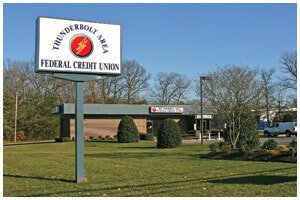 Subsequent to the closing of the overhaul shop located in Millville, We changed our name to Thunderbolt Area Federal Credit Union to better reflect the total area we now serve. We are grateful to all of the companies that owned the old Airwork business and provided us with a place to do business, especially Dallas Airmotive. 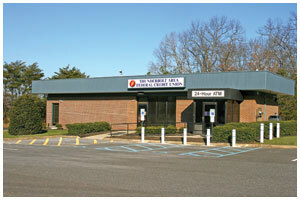 In November of 2008, We purchased the TD Bank building located at the entrance of Millville Municipal Airport, increased the size of the building by approximately 700 square feet and on August 22, 2009 we officially moved into 1601 Cedar Street. This is our property and we are proud of the work done to the building and appreciate the help from all the people who made this possible. Without the continued support of Hugh McElroy of Dallas Airmotive this would have been very difficult for us and we cannot thank him enough. He has supported us in all of our endeavors, but now we have a home. Come see us and remember we are there for you. Thank you for your donations. Our last donation pick up weighed in at 179lbs. Let's keep up the great work! All donations will be going to Health and Hope Ministries food bank and distributed to our community. Thank you for your continued support and generosity!